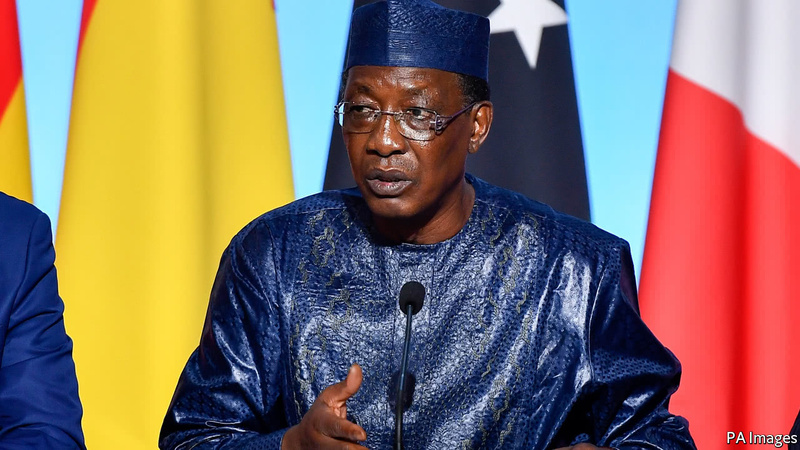 “A FOOL’S bargain.” That is how Idriss Déby, Chad’s president, now describes the state oil company’s decision to borrow $1.4bn from Glencore, an Anglo-Swiss commodities trader, in 2014. The loan was to be repaid with future sales of crude, then trading above $100 a barrel. But two years later, as the price dived, debt payments were swallowing 85% of Chad’s dwindling oil revenue. For weeks schools have been closed and hospitals paralysed, as workers strike against austerity. On February 21st, after fractious talks, Chad and Glencore agreed to restructure the deal. Chad’s woes recall an earlier era, when African economies groaned beneath unpayable debts. By the mid-1990s much of the continent was frozen out of the global financial system. The solution, reached in 2005, was for rich countries to forgive the debts that so-called “heavily indebted poor countries”, 30 of which were in Africa, owed to the World Bank, IMF and African Development Bank. With new loans and better policies, many of these countries turned their economies around. By 2012 the median debt level in sub-Saharan Africa (as defined by the IMF) fell to just 30% of GDP. Today the median debt level is over 50% of GDP. That is low by international standards, but interest rates are generally higher for African countries, which collect relatively little tax. Economic growth slowed in response to lower commodity prices. As a consequence, there is much less revenue to service debts. The pace of borrowing has picked up. 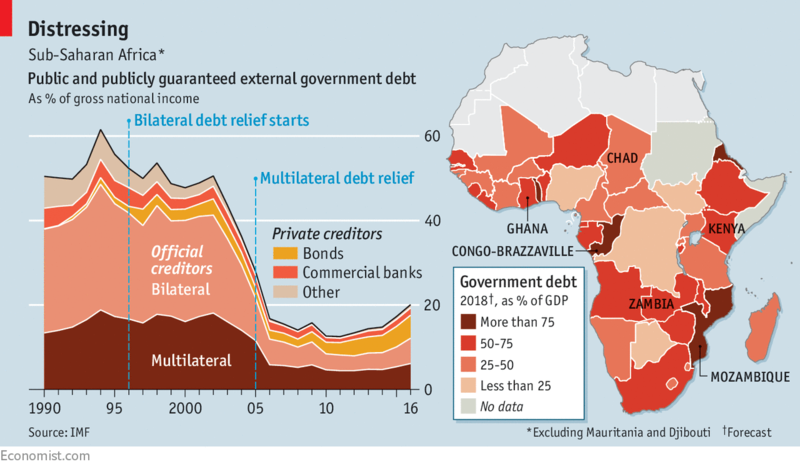 The IMF reckons that five sub-Saharan African countries are already in “debt distress”, with nine more at high risk of joining them. Lending to Africa surged after the financial crisis, when interest rates in rich countries sank to historic lows. Fund managers chased the high yields of African government bonds and the profits from a commodities boom. The biggest lenders to Africa had long been Western governments. But since 2006, 16 African countries have sold their first dollar-denominated bonds to foreign investors. Interest rates in the rich world remain low, so several countries are scrambling back to the market this year. Senegal’s $2.2bn Eurobond was five times oversubscribed on March 6th. Borrowing makes sense for poor countries if it finances things like roads, schools and hospitals, which improve welfare and support economic growth. But the keenest borrowers in Africa are also feckless spenders. Take Ghana, which racked up debt as it ran an average annual budget deficit of 10% from 2012 to 2016. When a new government entered office last year, it found a $1.6bn “hole” in the budget. The new chairman of the state cocoa board found that a $1.8bn loan meant to fund cocoa production in 2017 was “all gone”. By corroding and weakening governance institutions and the democratic values of human rights, gender equality, justice, and the rule of law, it has hindered the continent’s progress toward peace and prosperity. A 2002 AU study estimated that Africa loses about $150 billion annually to corruption. Illicit financial outflows, particularly in the extractive industry, cost the continent about $50 billion per annum – far exceeding the official development assistance that African countries receive from Organization for Economic Cooperation and Development countries ($27.5 billion in 2016).